As with a home, there can be many forms of heating in a cottage, some more convenient than others. Whatever the type of heating, you will use less fuel or power if your cottage is insulated. If your place is strictly for warmer season use, then insulation is not as important, and you will likely only need occasional heating. Electric heating now rivals other forms of energy in output and efficiency providing your abode is well insulated. If your cottage is not very well insulated, electric heaters may not be a good option as they may consume a lot of power which will have an adverse effect on your electricity bills. However, there are four major benefits of electric heating that I can think of. First, it is possible to leave it on at a low temperature during the winter, so that the water system does not freeze up. Secondly, it can be hooked up to a telephone line with a control device so that you can turn it on to pre-heat the cottage before you arrive there on a winter's night. Thirdly, it is very convenient, as you don't need regular deliveries of fuel as you would with propane or oil. Fourthly, the maintenance costs on electric heaters are practically nil. Generally, you need one or two heaters per room, depending on the size of the room. Baseboard heaters are convenient, as they take up minimal space, but I have difficulty understanding why most of them are installed under windows where the heat rising from them will likely go on the wrong side of the curtains and be lost out of the window. In the event of a power outage, all your heaters will go off, so it is advisable to have an alternative heating source such as a wood stove or kerosene heater. Oil furnaces are the dinosaurs of the heating world, and installation of them in new homes is declining. There are good reasons for this, as they can be smelly and polluting because of the high sulphur content in oil, and they get a lot of competition from other forms of heating. Annual maintenance costs can be high compared to natural gas and propane gas furnaces. If there is an existing oil furnace in your cottage, it is probably worth while continuing to use it until such time as the fuel and maintenance costs make alternatives attractive, or until the furnace dies. In rural areas, this means propane gas, as natural gas is unlikely to be available. If you are switching to propane from another form of heating, ensure that propane can be delivered easily, particularly if you plan to use the cottage extensively in winter. If you are using it only occasionally in winter, you may be able to fill up the propane tank in the fall and not need deliveries in the colder weather. Of course, if delivery is a problem in the winter because roads are not serviced, this will limit your use anyway. When the power fails, propane fireplaces can be a good backup for heating purposes. Wood stoves have a romantic connotation, especially those with glass windows through which you can see the flames flickering and hear the logs crackling. One advantage of them is that wood can be very cheap, particularly if you have a large treed lot with a number of trees dying each year. They can also be used for cooking, and can quickly heat up the interior of the house. Some airtight stoves can be loaded with wood late in the evening, and will burn all night long, keeping the cottage cosy even on the coldest winter nights. They are also a useful backup for when the power fails and other forms of heating and cooking shut down. Obtaining and using wood requires more effort than other forms of heating. 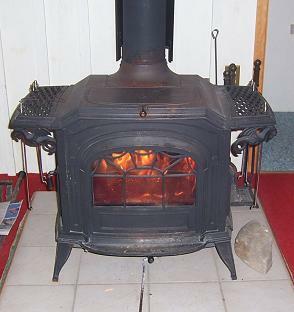 We have two wood stoves, and they constitute the primary source of heat in our cottage. This means that we have to be sure we have adequate supplies of wood before the start of each winter. Because we use the cottage infrequently in winter, we only need about two face cords of wood stacked up in the wood shed. (A face cord is a row of 16-inch logs that extends 8 feet long and 4 feet high. A full cord is three times this.) Our lot, although well treed, is not large enough to supply this volume of wood each year, so we have to buy elsewhere. Make sure that you buy hardwoods such as maple and birch as these burn hotter and cleaner than resinous softwoods such as pine, spruce and balsam. Softwoods generate more soot and creosote that will require you to clean your chimney more often. Tamarack (larch) is a great kindling wood, but dont burn large logs of it as it burns very hot, which may damage your stove or chimney. Sometimes, wood is delivered in chunks that are too large for convenience, and you have to either learn to split it with an axe, or rent a wood splitter. Before leaving the cottage to go home after a winter visit, we always ensure that we have enough split firewood in the cottage to start and maintain the wood stoves for at least a day. Make sure that you have smoke and carbon monoxide (CO) alarms in any room where there is a wood stove. The smoke alarms should be situated on the ceiling, but not directly above the stove, otherwise your alarm will be constantly going off when smoke escapes as you light the stove or add more wood. The carbon monoxide alarm should be situated low down on a wall away from the stove. These CO alarms were initially designed to plug into an electrical outlet, but the modern ones are battery-operated. Our furnace maintenance man at home tells us that these alarms should be replaced every five years without fail, more so because it is not possible to do a "live" test on a CO alarm in the same way as you can do with a smoke alarm by holding burning paper below it. Maintenance on wood stoves is fairly simple, but important. Too much build-up of creosote or soot in your chimney can result in chimney fires, so you should check your chimney each year, and clean it if necessary. Also, on airtight stoves, check the door seals and replace them if they start to deteriorate or fall off. Incidentally, transporting firewood from one area to another is frowned upon (if not illegal), as it can spread invasive tree-killing pests and diseases. So, if you chop down and cut up a tree in your home area and want to take it to the cottage to burn, it is not a good idea. Click on this link for more useful information on heating with wood. Worried about home insurance when you have a wood stove? Then read my article on insurance here.